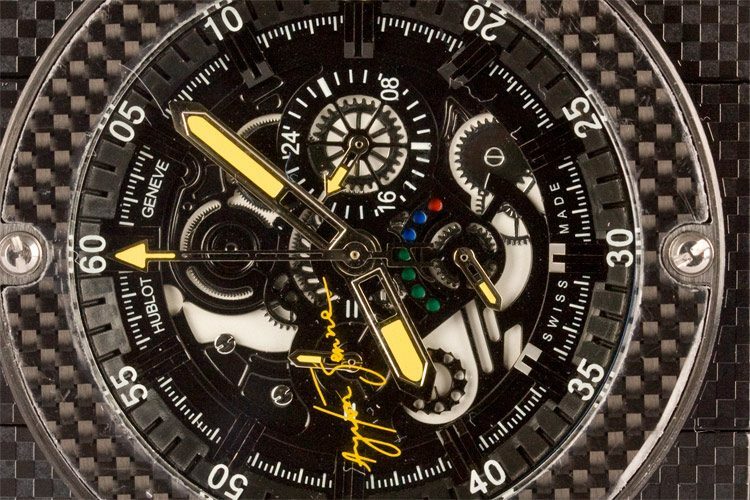 The Hublot King Power Ayrton Senna has been created as a tribute to the Brazilian driver Ayrton Senna. He died in 1994 during a Formula 1 race, grabbing the media’s attention and making people more aware about the safety in Formula 1. 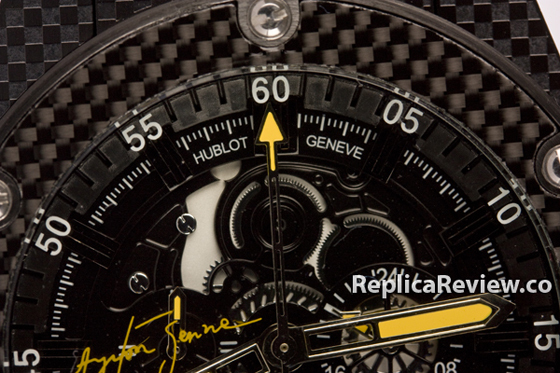 There were two watche models created by Hublot to commemorate Ayrton Senna and we can see one of them here. 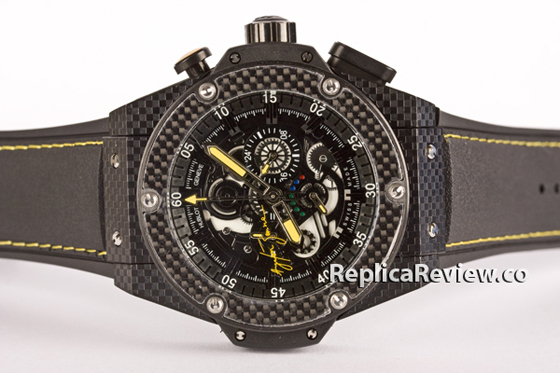 The watches were made from carbon fibers that gave them a very distinct look. We can easily see that this replica managed to capture that look very well, not being too light or too dark. 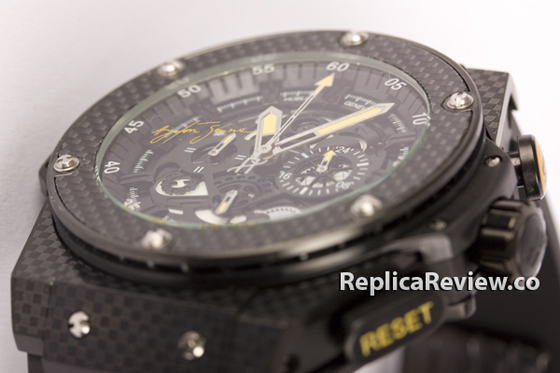 The bezels were also made out of matte ceramic and the King Power Senna replica also has that matte finish to it. 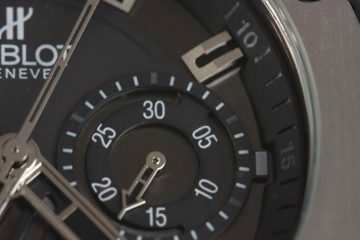 The watch has some accents that needed to be respected, some details that had to be incorporated to make it a true copy of the original. For example the bezel is matte and has to look like disk brakes, which means that it has small details that needed to be respected. 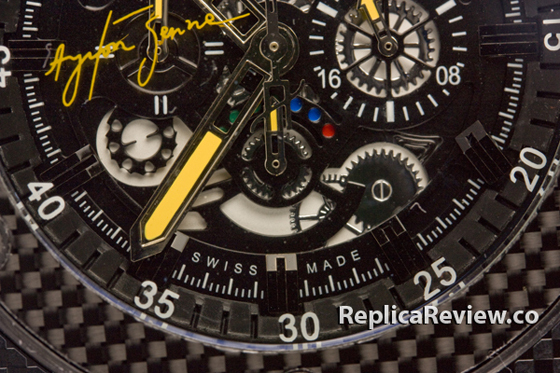 There is a difference when it comes to this detail as the replica’s bezel looks different than the original one, due to the fact that it looks more roughly designed. However it is decorated with the pattern that shows the F1 brake disk so it looks pretty similar but not exactly the same. The inner rings on the bezel are also a bit rougher and a bit thicker on the original watch than on the replica but that can only be observed by a trained eye. 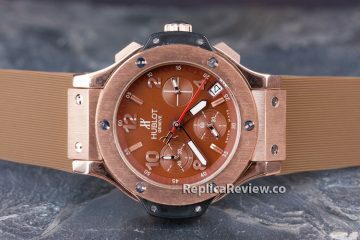 However the colors and the small details that can be found on the watch face are very accurate on the replica watch, including the color shades, a very important aspect that replica watch manufacturers sometimes overlook. With its skeleton interior, this watch should be very hard to replicate but was done very well this time. 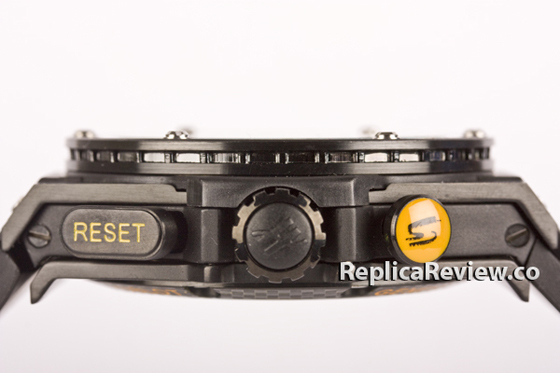 Another difference that can be observed is the fact that the screws on the replica have a lighter color, while on the original watch we can see that the screws are black. The belt of this particular replica is also very similar to the one on the original as it has the stitches in the same position but also the color that makes it more unique. The colors on the face of the watch indicate the F1 flag and the Brazil Flag. 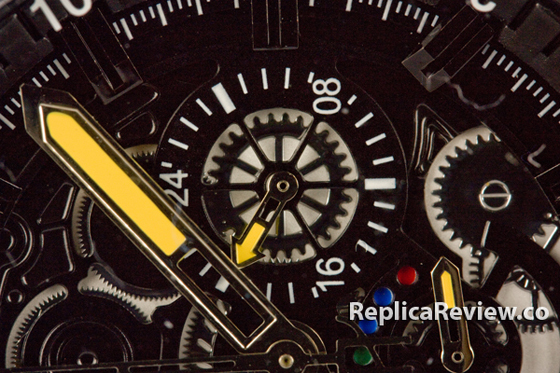 What sets this replica apart from the original is the lack of robustness is has, as it looks slimmer than the original watch and a lot less crowded. But this might be better for some buyers as they might like this design style more, as it doesn’t lose the feeling of an original watch. 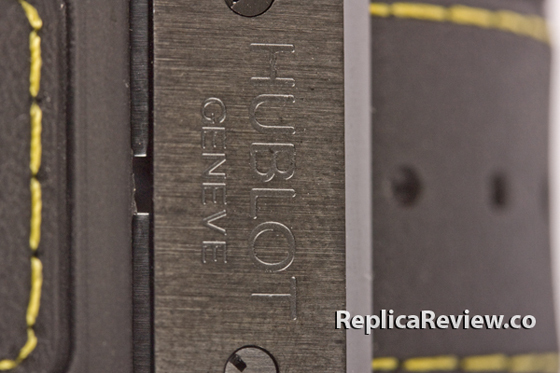 This replica watch might not be exact but judging by the amount of details on the watch it’s pretty accurate and manages to capture the idea Hublot wanted to show on their original watch. 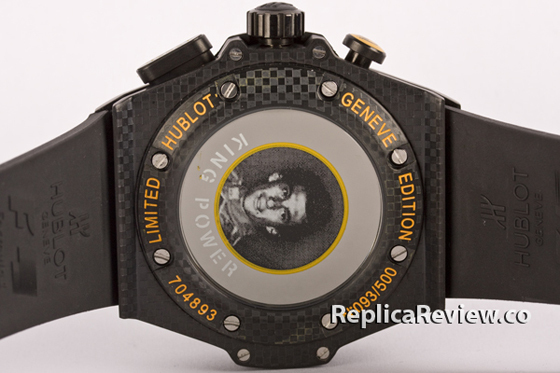 Well I am not satisfied with this replica of Hublot Ayrton Senna, seriously..